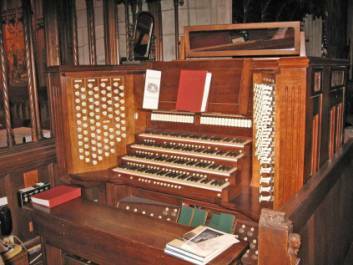 The mighty Mander console for the restored E.M. Skinner pipe organ in the Christ Church Cranbrook chancel. 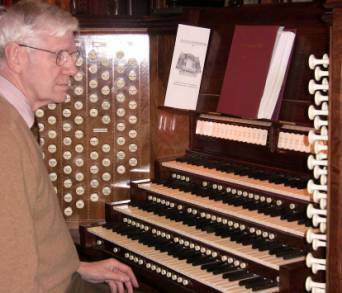 (Photo courtesy of Jim Wilkes) CLICK HERE FOR ORGAN HISTORY AND SPECIFICATIONS. 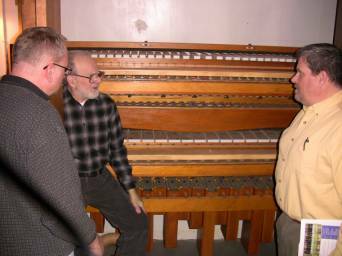 Terry Jankowski (l-r), Ken Holden and Jon Best discuss the harp mechanism in the pipe chamber. Terry Jankowski takes a turn at the console. Jim Wilkes surveys the many options available, with 96-stops over six manual divisions and two pedal sections. 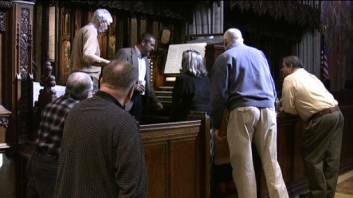 The March 2011 meeting of the Michigan Chapter of the Organ Historical Society convened at 9:40 a.m. in the sanctuary of Christ Church Cranbrook in Bloomfield Hills, Michigan. Present were Carl Balduf, MaryAnn Balduf, Jon Best (new member), Kenneth Holden, Terry Jankowski and Jim Wilkes. And Jay Turner (guest). 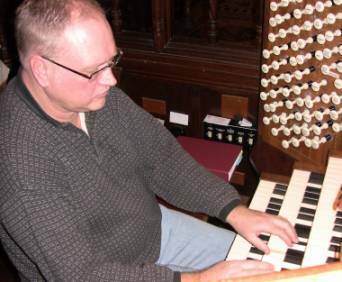 John Repulski, Christ Church Director of Music/Organist, hosted the meeting. The minutes of the October 16, 2010 were unanimously approved. Treasurer Terry Jamkowski then reported a balance of $1837.15. The report can be found below. Before proceeding further, a moment of silence was observed for the passing of member Al Hunter. He will be missed. Balduf reported that he has been unable to contact Brooks Grantier about the springtime western trip. He will keep trying. New business included a discussion of the purging of the membership and email list, to include only those who are paid-up members, plus certain OHS National councilors and officers. It was agreed that this should be done. On behalf of those present, Balduf thanked John Repulski for hosting the meeting. 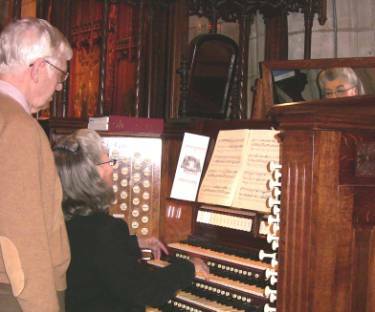 There being no further business, the meeting was adjourned at 9:50 a.m., after which John Repulski demonstrated the Skinner/Mander organ in the sanctuary and the small Bozeman organ in the chapel. An open console then followed, after which some members gathered for lunch in downtown Birmingham. MaryAnn Balduf plays as Jim Wilkes observes. 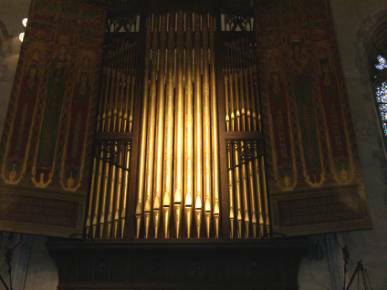 The facade pipes seem to reflect the golden sounds of the restored Skinner pipework.